On arrival at Jamnagar, you will be met and assisted by our representative and transferred to Jamnagar hotel.After fresh up visit Shiv temples, Jain temples(vardhaman, sheth, vasupujna), Bohra Hajira, Lakhota lake, Darbagadh area, Bala Hanuman night time.Over night stay at Jamnagar. Start early morning to Somnath (227 Km, via Junagadh) check into Hotel, After freshup visit local sightseeing -Gir forest (40 Km) Diu beach(90Km)).Over night stay at somnath. 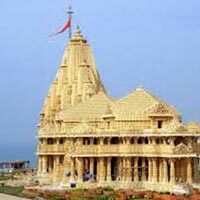 After breakfast go for local sight seeing - Gita mandir, triveni teerth, Bhalka teerth, Old and somnath temple,parasuram mandir .Over night stay at somnath. Start ealy morning to Dwaraka (233 Km, via porbandar) check into hotel.After freshup go for loal sightseeing -Gomti ghat, Gita mandir, Rukshemana mandir, Nageswar jyothirlinga, eveing Dwarakadeesh arati.Overnight stay at Dwaraka. 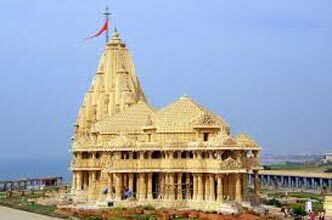 After break fast darshan of Dwarakadeesh and visit local sight seeing-Beyt Dwaraka.Overnight stay at Dwaraka. After breakfast Pick up and drop at Jamnagar airport catch your flight for back home with sweet memories.